Alice’s Adventures in Wonderland – Everything is Oll Korrect! `Oh, it needn’t come to that!’ Alice hastily said, hoping to keep him from beginning. Alice felt that in that case she really ought to listen to it, so she sat down, and said `Thank you’ rather sadly. When it gets late in the year and with Christmas coming soon, I always find myself in a nostalgic, and somewhat lazy, mood. It’s a time when my reading goes back to old favourites, and these past couple weeks I’ve revisited a couple of my favourite novels from yesteryear, Lewis Carroll’s Alice’s Adventures in Wonderland and Through the Looking-Glass. There are two claims here, so let’s start with the first: are the Alice novels really no longer children’s books? To be honest, I didn’t read them as a child, but first read them when I was about fifteen, coincidentally the age Gardner mentions above, though I do remember liking Disney’s adaptation of them. I can say that it’s not hard to find editions of the novel aimed at children, or at least older children, as well as at least one alphabet book. 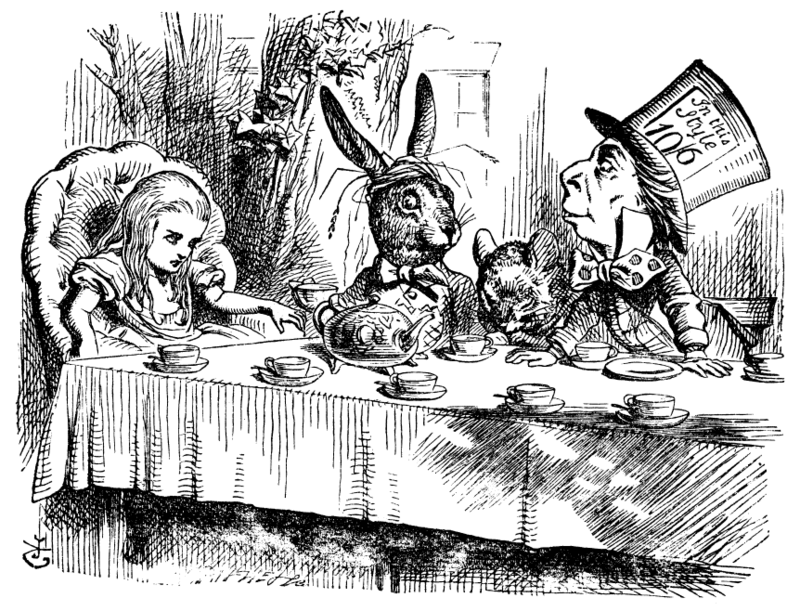 Gardner says that “Children today are bewildered and sometimes frightened by the nightmarish atmosphere of Alice’s dreams.” The books are surprisingly violent in parts and almost every character is a jerk to some degree, with the White Knight (very likely a stand-in for Carroll himself) and perhaps the Cheshire Cat as the only exceptions, but I’d hardly call either Wonderland or the Looking-Glass world “nightmarish,” and how frightened a child is would depend on the child. I’d have probably loved it. Some young children probably would be disturbed at stuffing guinea pigs into a sack and sitting on them, even if done by other animals about the same size as a guinea pig, but this is certainly no grislier than many fairy tales, at least in their traditional forms.